2014 sees the 30th anniversary of the year-long National Miners’ Strike which changed and affected the working lives of thousands of people. In support of those affected by the Strike and to ensure future generations remember, we have commissioned a new banner to be made for the Durham Unite Community Centre. The North East, Yorkshire & Humberside region of Unite is supporting this initiative, however its success depends upon all of us working and funding this together collectively. 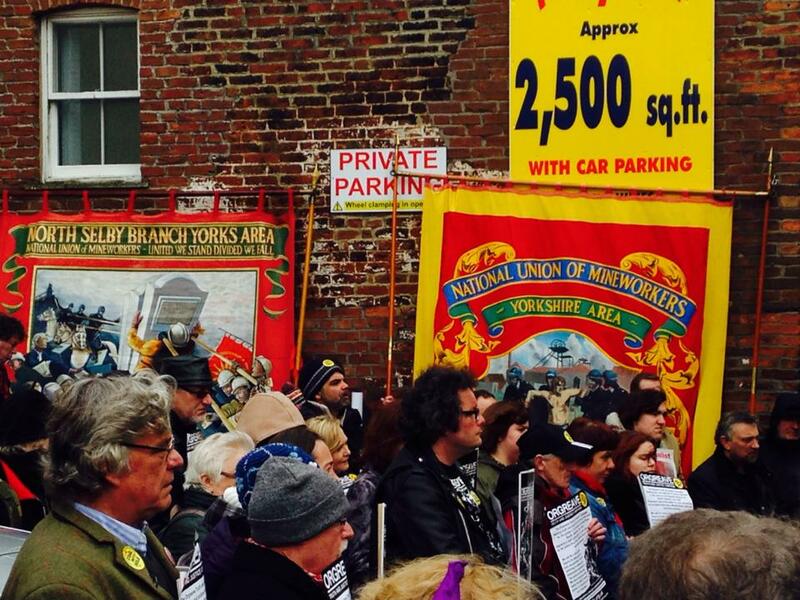 Please send cheques payable to Unite the union to the address below. Read the appeal letter here. 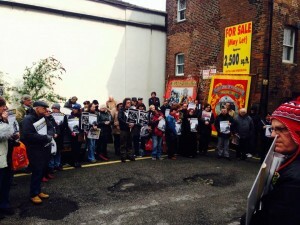 Over one hundred protesters from the Orgreave Truth and Justice Campaign, gathered today outside the Wakefield IPCC offices to call for more urgent action on their “scoping exercise”. Campaigners have grown frustrated by the slow progress from the IPCC, as we are now seventeen months into their investigation. 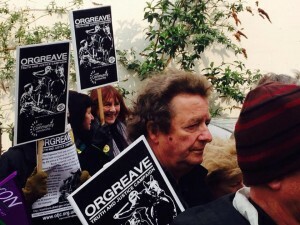 The Campaign has grown rapidly with wide support from the trade union movement and plans to hold a huge music festival on June the 14th on the site of the “Battle of Orgreave”. A demonstration in Wakefield will be held tomorrow (Friday 28 March) into the delay by the Independent Police Complaints Commission (IPCC) on whether it will launch a full inquiry into what happened at Orgreave during the 1984 miners’ strike. 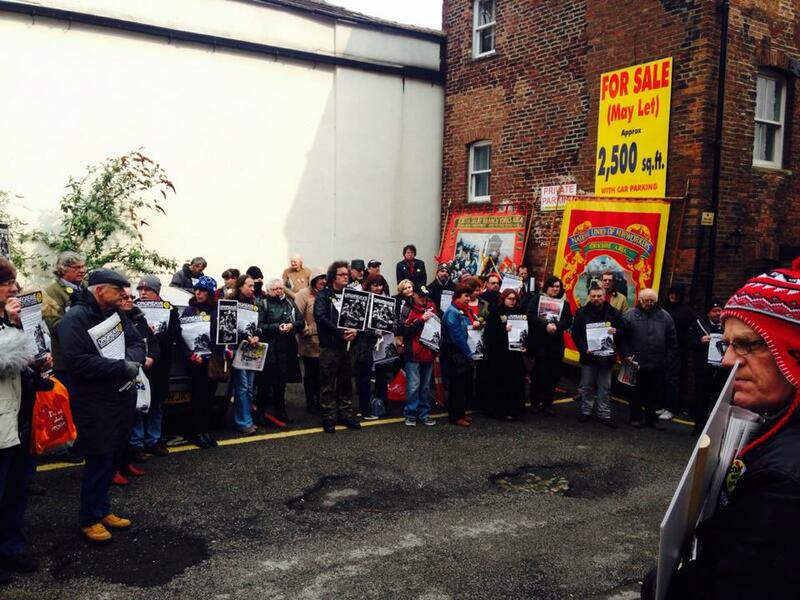 The Orgreave Truth and Justice Campaign (OTJC) is holding a second demonstration at the IPCC’s office at Pioneer House, Woolpacks Yard, Wakefield WF1 2SG at 13.00 tomorrow. Protesters will include community activists, members of Unite, the country’s largest union. OTJC members are disappointed at the length of time the IPCC is taking to decide whether it will launch a full investigation into the alleged criminal activities of the South Yorkshire Police (SYP) at the Orgreave coking works, near Rotherham, in 1984. In June 1984, 95 miners were arrested at Orgreave after police officers – many in riot gear, with others on horseback – allegedly assaulted miners striking to save pits, their jobs and their communities. However, when the subsequent court cases took place all of the charges were abandoned. Later, SYP paid out £425,000 in compensation to 39 pickets in out of court settlements. Nevertheless, no police officers were disciplined for misconduct or charged for the alleged injuries they caused to those they attacked. In November 2012 the SYP referred itself to the IPCC to decide whether there should be a full investigation into what happened at Orgreave. The IPCC has had 17 months to conduct its investigation. Unite regional community coordinator and OTJC chair Joe Rollin said: “Sadly, the IPCC appears to have undertaken a very limited amount of work in collecting and collating information on what happened at Orgreave. It is moving at a snail’s pace. However, the OTJC welcomes the decision by the Labour party to launch its Justice for the Coalfields campaign and calls on Ed Miliband to confirm that a Labour government will order a full public inquiry into events at Orgreave. An animated short film made by the young women from the youth council at Barnsley marking the 20th anniversary of the miners strike.